I mean, a lousy economic “recovery,” unemployment above 8% for the longest stretch since the Great Depression, millions more on food stamps than when he took office, and yet Obama can say that his plan worked? I guess, if by “worked” he meant it in the “Evil Mastermind rubbing hands in glee” way. Some day they’ll learn to quit handing Romney clubs with which to beat them, but hopefully not until after November. PS: Romney 2012, because his English dictionary wasn’t printed on the Bizarro World. You may recall that, a couple of weeks ago, Mitt Romney spoke before the NAACP at their annual convention. The reception he received was mixed: some standing ovations mixed with jeers at his promise to repeal ObamaCare. CBS does a pretty good job giving a myriad of examples of that dissatisfaction, even while in nearly every other paragraph, CBS reporter Leigh Ann Caldwell mentions how, dissatisfied or not, they are all still voting for Obama. But that constant reassurance aside, the piece is filled with example after example of the grumbling from black community leaders and politicians all essentially saying how disappointed they are that Obama has done so little for them. The piece leads with complaining from Philadelphia Mayor Michael Nutter and Rep. Maxine Waters (D-CA), both of whom are annoyed that black unemployment is so much higher than that of other communities. Obama is also criticized for not showing much leadership on other issues that affect the black community. The piece notes, for instance, that Obama has done little on the violent crime that plagues big city black communities, and he’s also criticized for not speaking before any of the nation’s African American organizations like the NAACP or the National Urban League. All in all, it seems that many in the African American community feel that Obama has failed to live up to his “unique role in history” and that he’s allowing “political expediency” to rule the day. Well, let’s just say David Axelrod probably isn’t sleeping well at night. PS: Romney 2012, because I want a president who cares about Americans, but doesn’t care about their skin color. President Obama recently got himself in a bit of hot water with his “you didn’t build that” remark, which trivialized the hard work of entrepreneurs. But he is right – in a perverse way – about government playing a big role in the life of small businesses. Thanks to a maze of regulations, the government is an unwelcome silent partner for every entrepreneur. And we’re not talking small numbers. For every bureaucrat at a regulatory agency, one study estimated that 100 jobs are destroyed in the economy’s productive sector. But sometimes an image helps to make things easy to understand. 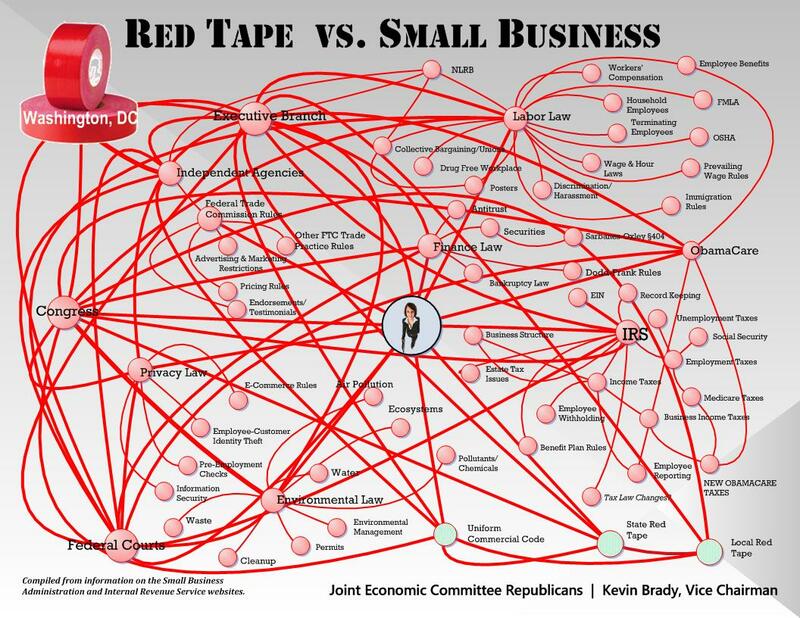 Here’s a chart from the Joint Economic Committee, which maps out the web of regulation imposed by Washington. You are currently browsing the Public Secrets blog archives for the day Thursday, July 26th, 2012.